Many families spend their summer vacations in New Hampshire’s Lakes Region. Why not make it a year-round affair at Meredith Bay? 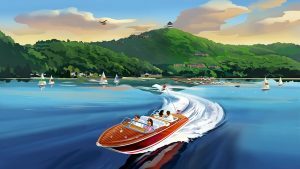 Although Lake Winnipesaukee gets the most attention as a supreme swimming, boating and fishing destination, the region offers great opportunities to play in all four seasons. Here’s how you can enjoy the tranquil Lakes Region whether it’s July or January. Come for vacation. Stay for a lifetime. Covering 72 square miles, Lake Winnipesaukee is one of the region’s most popular spots to stay cool. After a swim, relax along the shore at Weirs Beach. After a full day at the lake, take the kids to the penny arcades, the bumper car rides or the Go-Kart Track. To get away from the crowds, visit one of the area’s smaller lakes. The region has 250 of them! For starters, visit Newfound Lake at Wellington Lake Park in Bristol. New England Today named it one of New England’s prettiest lakes. Another great option is Squam Lake, perfect for kayaking and canoeing—and the site where the movie “On Golden Pond” was filmed. 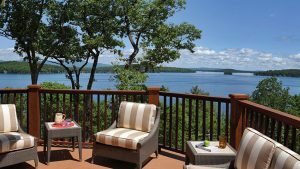 If you have a home or condo at Meredith Bay, you have access to Lake Winnipesaukee as well as both beachside and hilltop swimming pools. After perfecting your tan, stroll to the Beach Bar for a bite and a cocktail. Try your hand at beach volleyball. Or simply enjoy the fresh air and the views. The cool fall air ushers in more enjoyable Lake Region activities. With less heat and humidity, you can enjoy a long hike in the woods, taking in the stunning fall foliage. If you like cycling, the quiet roads beckon. As September draws to a close, take the kids to Moulton Farm to wander through the seasonal corn maze and pick the perfect pumpkin. For another favorite fall activity, visit Stone Brook Hill Farm in Gilford to pick apples from its 1,600 trees. Stop at the farmstand for homemade apple cake. There’s no reason to stay inside when the weather turns cold. Bundle up and hit the slopes for skiing and snowboarding at Gunstock Mountain Resort, Waterville Valley or Loon Mountain, all a short drive from Meredith Bay. Not interested in flying down a mountain on skis or a snowboard? Why not try cross-country skiing? And even in winter, the incredible Lake Winnipesaukee is not off limits. Ice fishing is a local tradition. Try it! After a day outdoors, order a cocktail and sink into one of the oversized sofas at Lakehouse Grille at Church Landing. It’s only 10 minutes from Meredith Bay. After a long winter, you can finally shed a few layers and get back on the water. In spring, Lake Winnipesaukee becomes a premier fishing destination. Will today be the day you catch the big one? In between lake outings, spend a few days exploring the area at your leisure. Visit the small towns along the shore. Pick up some locally made wine and preserves. Stop in the local antique shops and art galleries. Treat yourself to a hearty meal at one of the area’s steakhouses. Which season would you prefer to spend at Meredith Bay? For a romantic day trip, take your sweetheart to Castle in the Clouds, a 1914 Arts & Crafts mansion that sits on a 5,500-acre mountaintop estate. Take a tour of the castle and enjoy 28 miles of hiking trails, horseback riding and incredible lake views. To experience the Lakes Region at any time of year, make your home at Meredith Bay, a new community of custom homes, townhomes and condominiums. Located on the western shore of Lake Winnipesaukee, Meredith Bay is only 90 minutes from Boston, three hours from Hartford and 50 minutes from the Manchester airport. Because it’s located atop the former Brickyard Ski Area, Meredith Bay offers stunning views that extend to Mount Washington and Alton Bay. It’s close to the city, yet worlds away. Visit Meredith Bay today to experience all the community has to offer. Call 888-559-4141 or contact them online to schedule a tour and for more information.